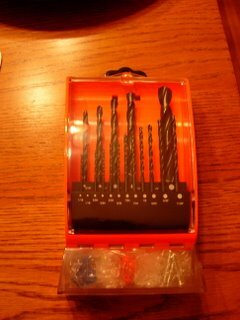 Yesterday I made a quick trip over to Menards to pick up some new bits for my beloved Black & Decker drill. The ones I had were pretty well shot, and I needed something sharp to start work on soaking the wood consolidant into the bracket over my front door. So, I was standing in the aisles debating what to buy when I spotted an entire set of 18 B&D bits on clearance for $5. As an added bonus, the packaging told me, I got a little set of screws & anchors for free as a gift. This free gift was neatly stored in the bottom of the bit case. I thought to myself - even if I only get one use out of each one, it's a deal. I bought the clearance set and was on my way. I got home and took off the plastic wrapping. The bits were inside a funky little plastic case. For the next 15 minutes I sat there trying to figure out how to get that case open. I kid you not. 15 minutes. I finally figured out that you needed to push down on one spot while simultaneously pulling open a hinged door....then they all came spilling out. Good grief. I went outside and got to work. Later in the afternoon, I decided I needed to take a closer look at the "free screw & anchor gift." For an hour I worked on opening the little compartment at the bottom of this case. I could not do it. I am a fairly clever girl, and I could not get this little compartment open to save my life. I put the box down. This evening I once again picked up the box. How hard could this be? For another hour I sat and tried to open this little compartment to look at those damn free screws and anchors. I am now convinced that the compartment does not even open. What appears to be screws and anchors through the plastic is probably just a photo. Is it possible that the folks at B&D made such a poor packaging decision that no one could open these contraptions.....and as a result all the stores had to mark them down on clearance? 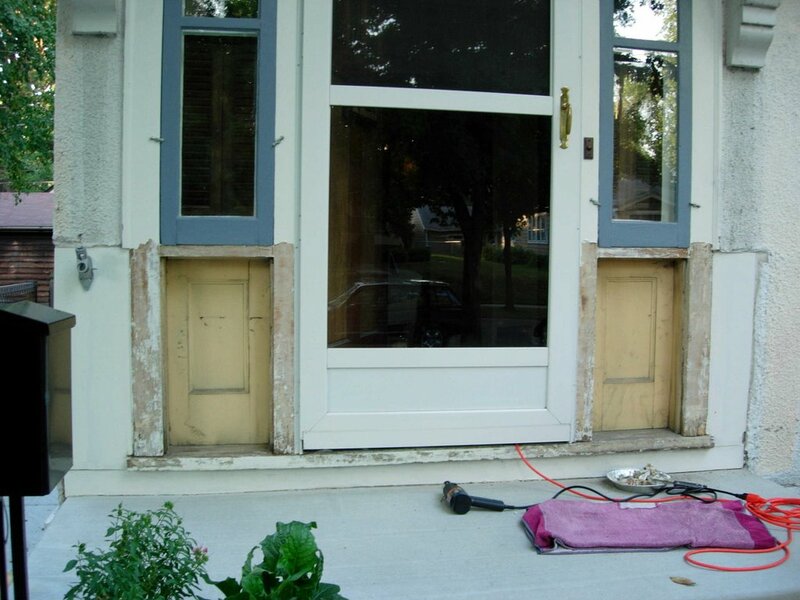 The majority of old houses in the Twin Cities originally came with one set of wooden window screens and one set of wood framed, glass storm windows. Alternatively, some houses came with wood framed glass storms that tilted out during the summer. 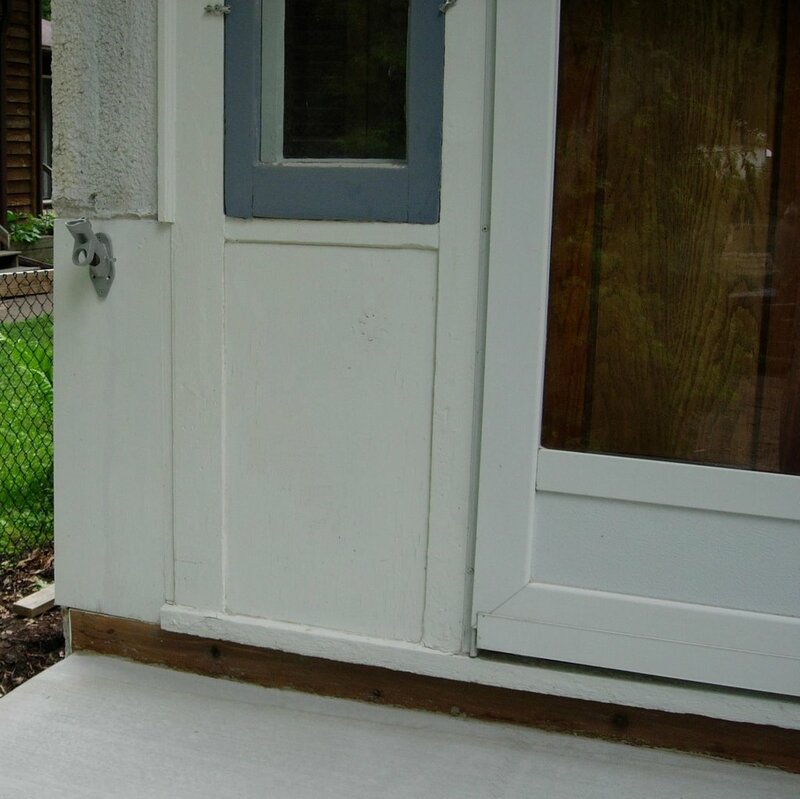 We get very cold winters here, so storm windows are a big deal. For the sake of this post, I'll talk about the former. In my past house and my current house, the wood frames of the screens were originally painted a medium dark green. The wood storms were painted gray. I guess this was a popular color combo for yellow stucco back in the 1920's because both houses had almost identical paint colors. I still have 9 original storms (including the two we have been talking about in my entryway) and 6 screens. So, when the seasons changed and the owners switch the screens for storms, the look of the house changed from green trim to gray trim. Very cool, I think. I mention this because knowing this gave me a few clues about the recessed panels I uncovered at my front door. My instincts told me that the little ridge on the edge of the inset had something to do with the storm windows covering the windows above it. Earlier this week I took a walk through my neighborhood to see if I could find a similar set up without any luck. 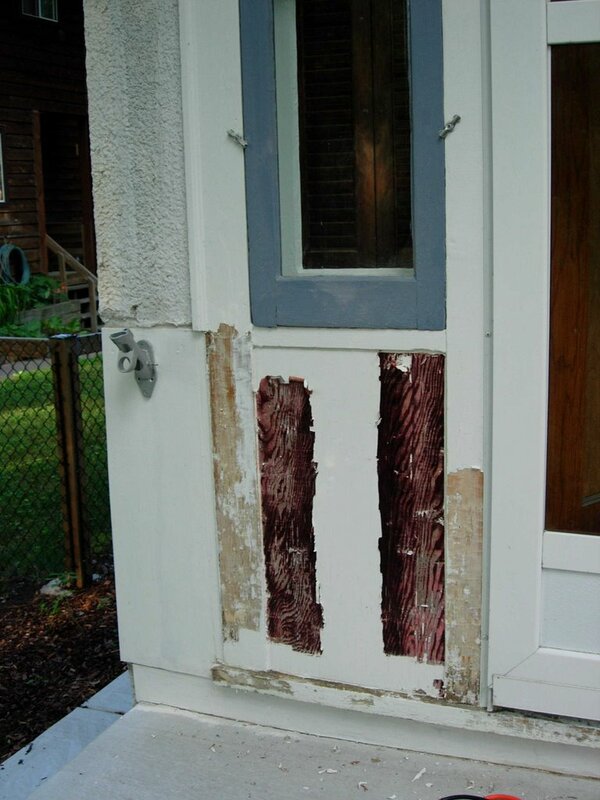 A few houses had storm windows on top (just like mine currently does) and the recessed panel below was left as is. 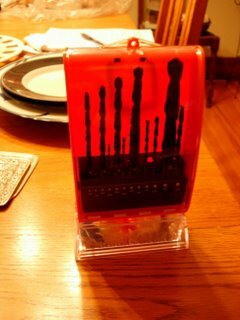 It would be like mine currently, but painted. Then there were a couple that did not have storm windows on the upper set of windows and a recessed panel below. This left both spaces inset at the same level. Finally, there was a house that had storm windows on the upper set of windows and a little "storm panel" covering the inset. The "storm panel" was held in place with wing nuts just like the storm window above it. A few of the houses had mail slots in the recessed panels. Here's what I think the story is. I think that originally the front door side windows came with one set of screens and one set of storms. 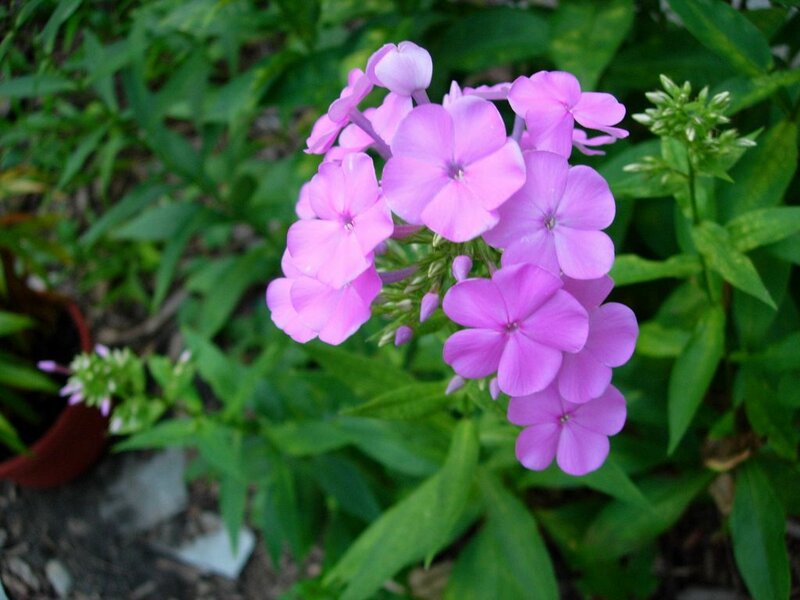 They were changed seasonally - probably different colors. I think they also came with two sets of little "storm panels" for the recessed space below the windows. One green panel and one gray panel, in my case. These were changed out to match the storm/screen above them. 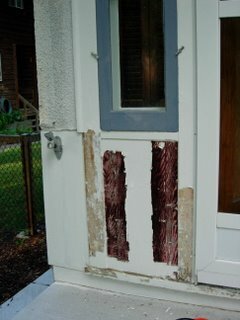 If the window was left without a screen or storm, the panel was entirely removed and the paint matched the muntins on the windows. 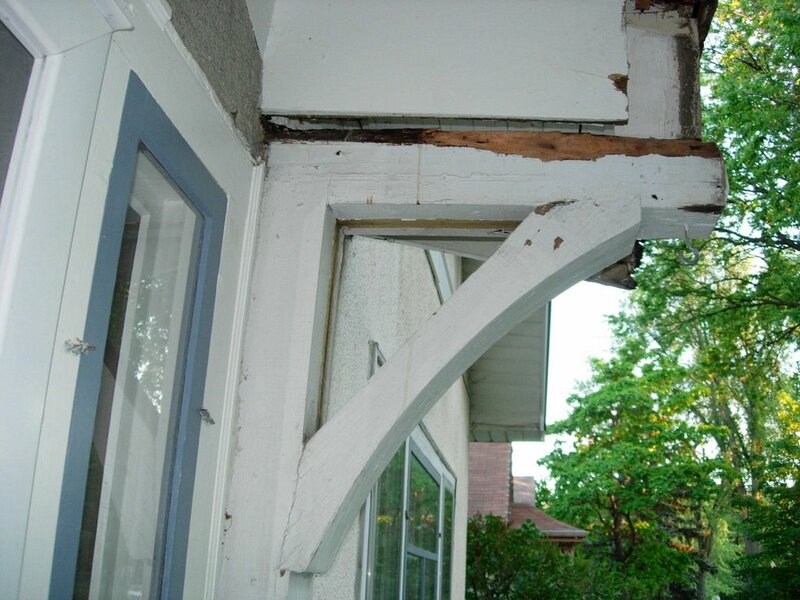 As home owners started replacing the old screen/storms with combination storms, many of the old screens & storms were thrown out. When this happened, I'll bet changing those little panels became a moot point and many of them were lost. I went out and took a closer look at my front doorway and found holes on each side of the panels where presumably little wing nuts once were used. I always feel weird about taking photos of other people's houses, but I may try to get back over to that block and take a few photos for reference. 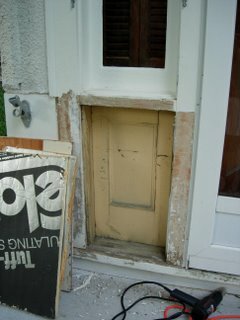 Yesterday I started to remove the layers of old paint surrounding my front door and in doing so, made a little discovery. Today I scraped the paint off the other side of the door. Much to my relief I found a matched pair of little recessed panels. I'm not quite sure what to make of these little insets. They are set back the same distance as the windows above them (without the gray storms). I can't figure out if they would have been covered by a glass storm window like the spaces above it. They seem kind of low to have glass in them and the only thing you would see through the glass is the wood inset. But, they are recessed too far to just let uncovered, I think. Maybe they were covered with a solid wood storm panel with matching wood trim. I spent some time browsing through my copy of Jane Powell and Linda Svendsen's book Bunglaow Details: Exterior looking for something similar with no luck. Tomorrow I think I'll go for a walk around the 'hood to see if I can find a house with a similar set-up. I do know this little discovery will make my quest to add a mail slot a whole lot easier. 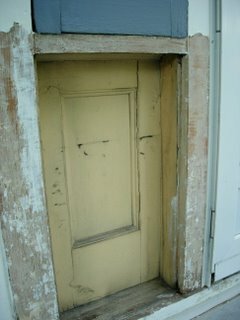 I think they also add some interest to the front door....even if they are in desperate need of paint. This was a nice, unexpected surprise. The plan is to finish scraping off the old paint surrounding the door and the overhang and prime the whole scene. The funny thing is that I had picked out a gallon of pale yellow paint to use on the trim of the house in addition to the current off-white (the storm & screens are gray). 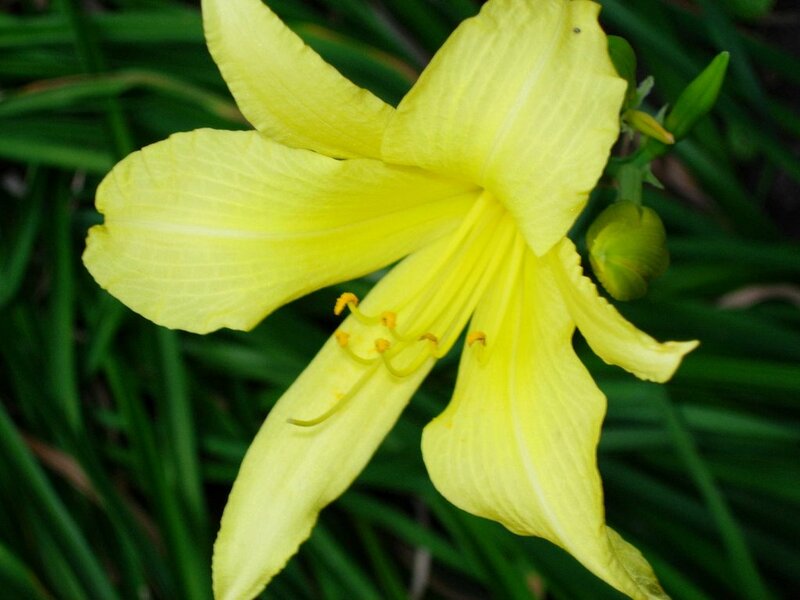 The pale yellow is just a shade lighter than the original color. My day was a little like one of those tv crime shows that starts off with a close up of a dead body and then the camera pans out to show a person standing, looking dazed, covered in blood and holding a gun. When the detectives arrive, the person can barely remember what happened. I started off today priming the replacement piece of beadboard I bought for my front door overhang. Then I went outside to caulk the cracks between the old pieces of exisiting beadboard under the eaves. I then vaugely remember noticing the allegatoring of the paint on the trim surrounding my front door and thinking to myself I really should take care of that. Hours later I found myself surrounded by paint chips and holding a smoking heat gun. When the caulk was removed and the plywood pulled out I found some relatively new foam insulation boards. Behind the insulation, I discovered this decorative board with only one layer of the original paint. On the sides are little ridges for a storm window just like the window above it. A few months ago I got copies of old photos of my house from a couple that lives across the street from me. Those photos dated back to the 1930's. Well, last week I got to chatting with my next door neighbor and he was describing to me what the now-torn-down front "porch" looked like. It was added sometime in (perhaps) the 1950's-1960's and enclosed the top stoop and main door. 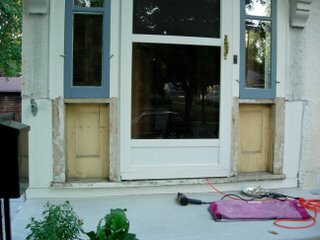 When I tore up the wood front step, we could see shadows of what had been there. 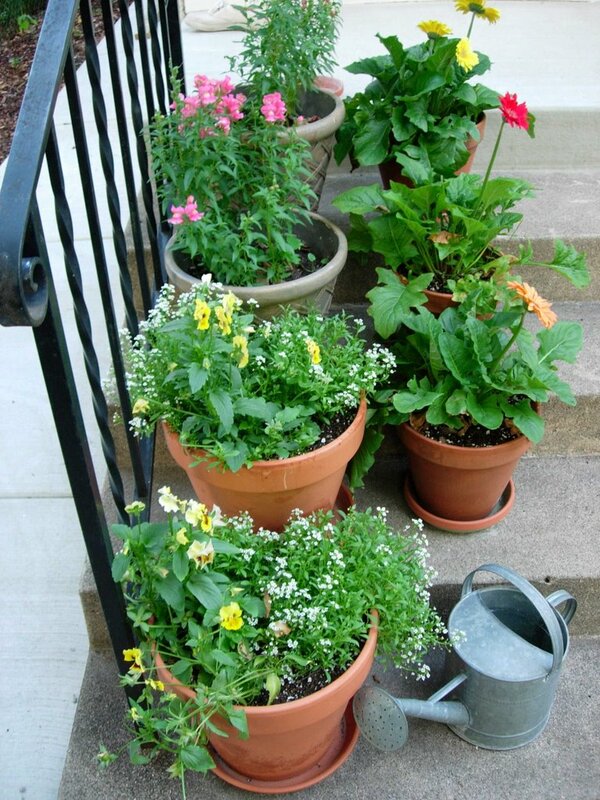 There are a few people in the neighborhood that remember it and described it as a "funky little add-on entryway." No one seemed particularly impressed by it, and by all accounts it was in bad condition when a P.O. finally tore it down. At any rate, my neighbor offhandedly mentioned that he may have a photo of it from the 1990's. I told him that if he was able to find one, I would love to get a copy of it. Later that afternoon, he dropped off a photo that shows the little porch that was. It's not overly clear, but it gives me a pretty good idea of what was there. I have no intention of recreating this work of art; it's just fun to see it. I was also pretty surprised to see that the cedar tree that is on the side of my sidewalk up to the house and now reaches the height of my roof is less than 15 yrs old.....and here I thought it was an original. This afternoon I went out and bought a cedar 1"x10"x4' board and some t&g beadboard to use in replacing some of the rotted boards of my front door overhang. I decided to prop them up against my house under the overhang for a while to instill confidence in my neighbors that I actually intend to repair the damage. Maybe in a couple of days I will prime it and put it back out there to dry, just to show them I am making some progress. It's the yin and yang of old houses. 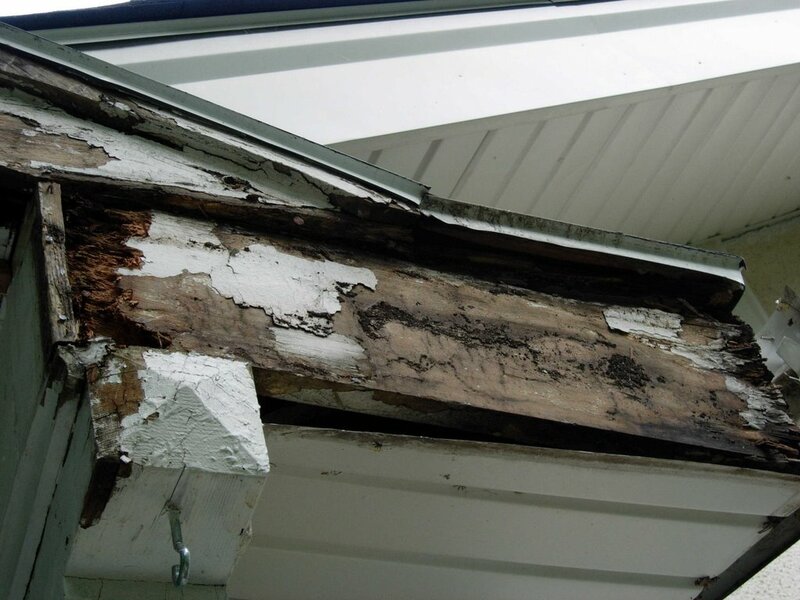 On one hand, you have rotted wood over your front door. 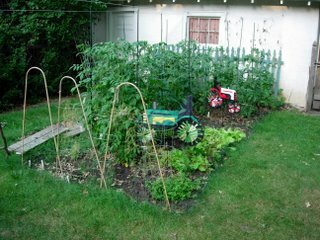 On the other hand, walk around to the back yard and the roses, phlox and day lillies are just blooming and the tomato plants have amazingly grown 6 more inches. 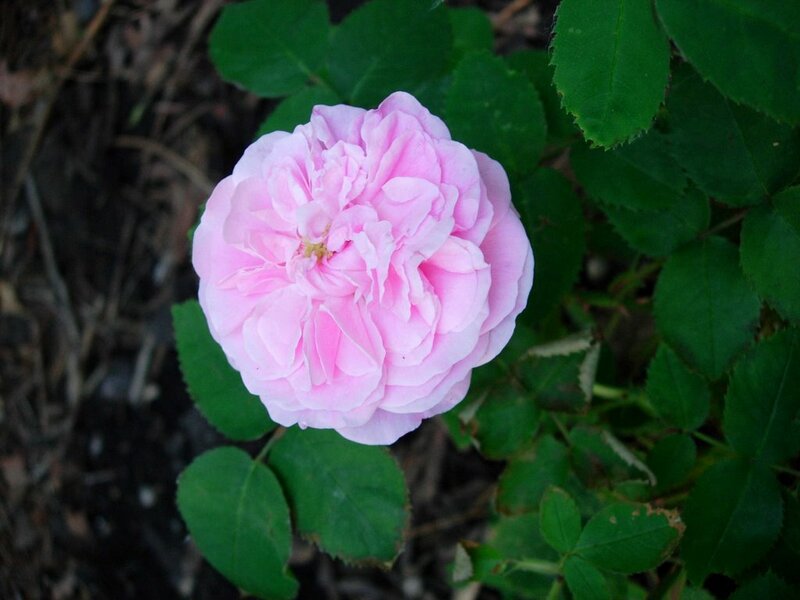 Last Friday I wrote about how Boredom spoke to me. 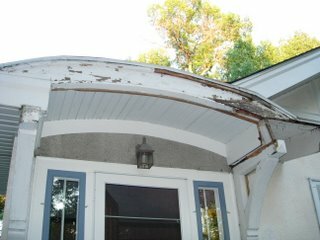 It told me that it would be really fun to tear down some of the aluminum trim covering my front door overhang. Here's the thing about Boredom. It speaks really loudly when it wants you to do something. But, then, when you are standing with a pile of aluminum trim at your feet and rotting wood hanging above....and you could use a few words of encouragement......Boredom is nowhere to be found. Here is my progress from this weekend. I was a little freaked initially after pulling down the aluminum and facing a bunch of rot. I'm comfortable working on the inside of my house. Stripping woodwork, refurbishing windows, painting, replacing floor boards....I'm your girl. But the outside of my house is not my forte. I think I have a lack of understanding of how it was put together, and therefore it's a bit daunting to me. I decided that what I would do is break the front overhang down into a series of smaller projects. Remove aluminum. 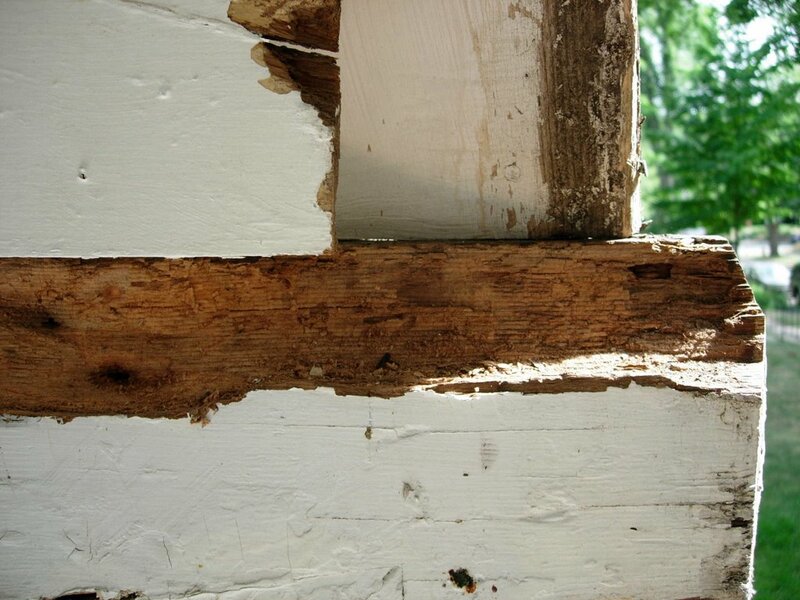 Assess the wood and remove rot. 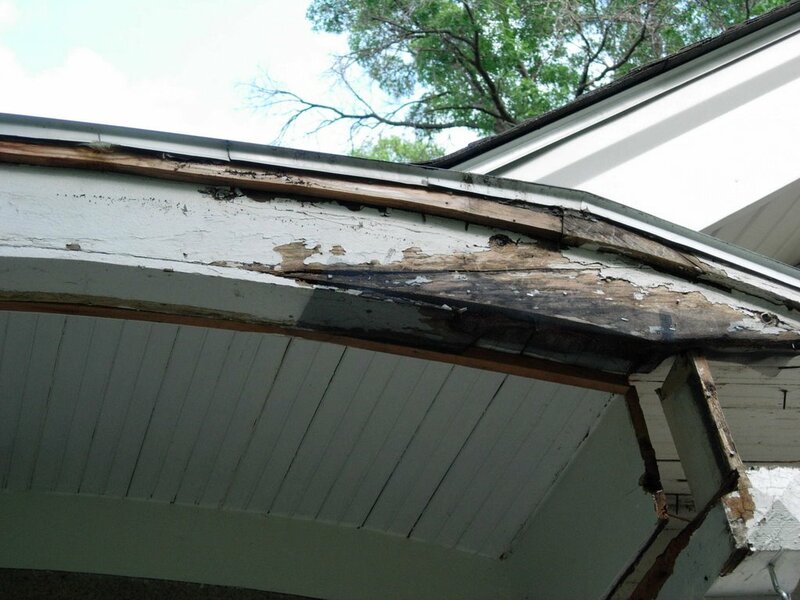 Repair rot. Strip paint. Figure out what wood needed to be replaced. Then, if I reached a point beyond my skills I could find a carpenter/roofer/whatever to finish up. I tore off most of the aluminum. The fascia board was rotted. rotted, rotted. I was able to just pull it off. Happily, there was tongue & groove bead board under the aluminum soffits. It doesn't look pretty and there are roofing nails coming through, but it appears to be sound with only a little rot on the outer edge of the last board (the one that was next to the rotted fascia board). 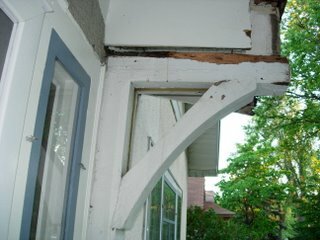 The two boards coming out of the stucco are ok, with the exception of rotted edges. It looks like the one over the bracket has already been repaired once, as there was an extension added at some point (now leaning at the top of the bracket)...although I can tell by the paint that this was done quite a while ago. 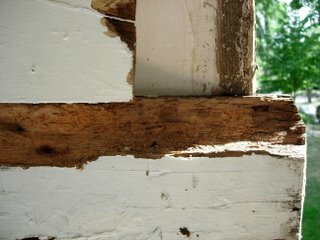 I'm still not sure what to do about the rot on the edge of the boards. I suspect if I remove these boards, it leads right into my attic. So, I need a plan in place before I start pulling that stuff down. 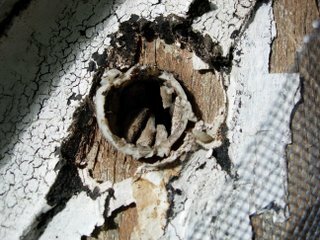 The top of the bracket is seriously rotted. 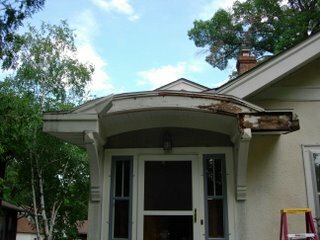 I think the rain ran down off the roof....to the rotted fascia board....and rested on the top of the bracket. I dug out the rotted wood. There are ants & ant eggs everywhere. Yuck. 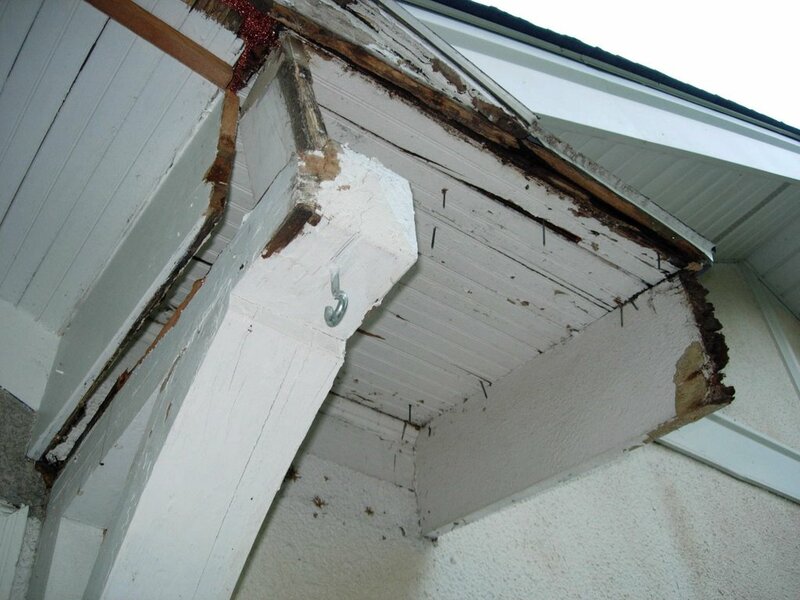 I've ordered more wood consolidator & 2 part epoxy to repair this. I usually use P.C. Woody products because the local paint store carries them, but I've decided to use Abatron on this piece. Their Liquid Wood & Wood Epox are a little more heavy duty. There is a 1x4 board that runs under the overhang. A section of about 6" (on the right) is rotted and I pulled it down. I bought a 1x4 board of cedar this weekend. But, for the life of me I can't figure out how to get enough curve on the board to be able to nail it up. Another interesting thing I discovered is that there are old vent holes through the face board of the overhang. Typically these would be found hidden under the soffits. Of course, they are filled with old paint and gunk now. But, I thought it was a little strange that these vent holes would run through trim...especially over the front door. There are quite a few of them....something like 7 of them running across the front. 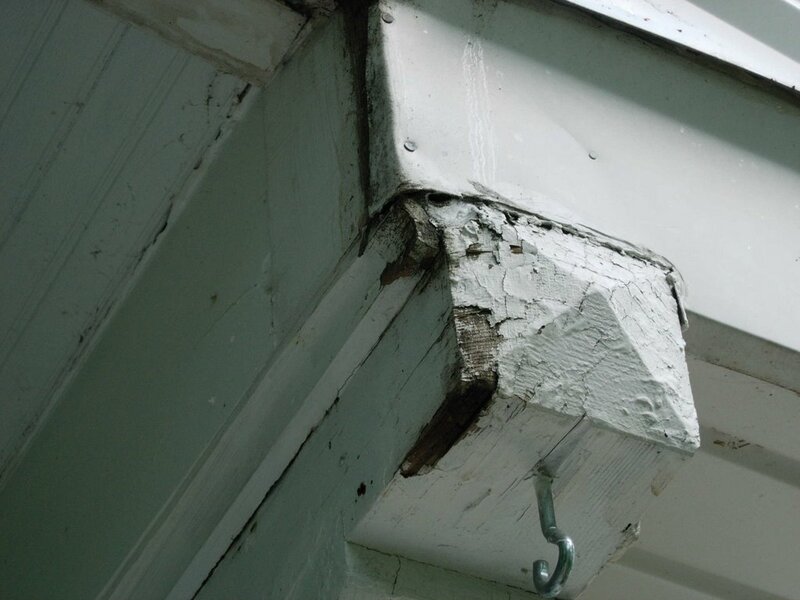 This also gives me a clue that directly behind the trim is the attic and not a stucco exterior wall. The bracket had a little "wall" in the V made out of some old pressed cardboard board. I'm sure it was put there to prevent birds from nesting. I tore this out so that both brackets are now open. I can see the old paint in the removed section, so I know that the little wall is not original. I think it looks better without it, but I'll have to figure out some way to keep birds from nesting there. 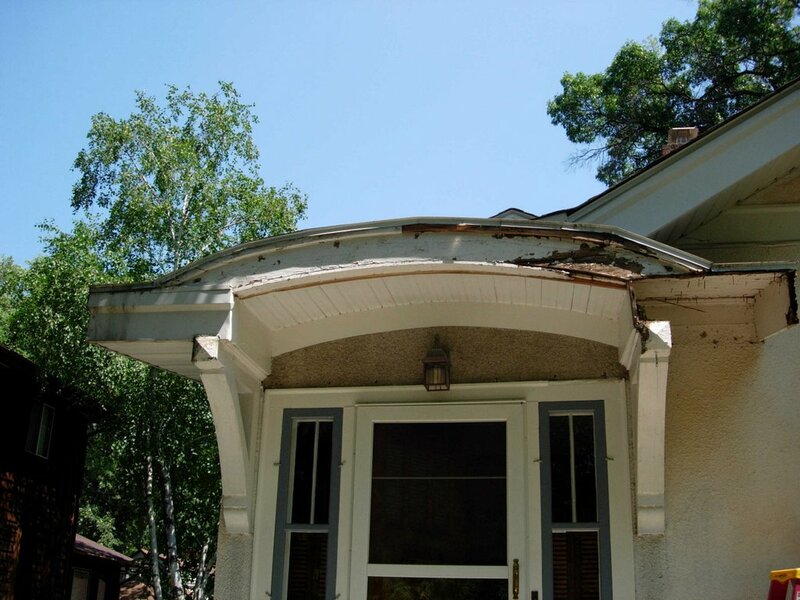 This portion of the roof is covered by a roofing membrane/sheet. The rest of the roof is shingles. It seems to me that the rain comes down the roof, runs over the edge, down the sloppily attached drip edge and over the fascia. This seems to be why it rotted. You can see in this photo how the shingles go over the edge of the roof about an inch or so on the roof in the background. However, on the overhang, there is no little such "shingle" ledge. I'm not quite sure what to do about that. Next I'll start scraping the old paint off of the wood fascia. I'll use my heat gun and remove the paint I can't scrape off. The idea is to get the bare wood primed as soon as possible, so the whole mess will at least look pretty from the street. Well, that was a little weird. I checked my blog this morning only to discover that most of my blog template code had disappeared. Gone. Just vanished. Now normally I would suspect user error, but this was many hours after I had successfully published my last post......and many hours before I was actually out of bed. Huh. A glitch in Blogger? A glitch in my computer? Working on my blog in my sleep? The editor at Old House Journal (For those following that story....I am just kidding, of course) tired of all my photos? Some evil hacker bent on destroying Stuccohouse? We will, no doubt, never know. But there is a lesson to be learned here. Back up that blog template code! The only thing I lost was my foreign language translation code - which for the life of me I can't remember where I got......and a few "Neighborhood" links. There is a cute commercial running on the radio. It's for a local shopping mall, I think. They are urging parents to bring their children to the mall to meet their favorite cartoon characters. The ad warns parents to keep their kids busy this summer. Because, the ad says, ...."Boredom speaks to children. It says things like 'wouldn't it be fun to color on the wall with mommy's permanent markers?.........or 'spit the pudding out through your teeth - extra points if you hit the dog...'" The ad always gives me a chuckle. Turns out Boredom also speaks to adults. It says things like: "I wonder what is under that aluminum trim." "How bad could the wood under there be?" "How much fun would it be to just peek under there?" The wood on the arch is good. The old paint actually falls off. I think I can get the old paint off, sand, prime & paint that. However, the 2x6 on the right end is pure rot....as is the top of the bracket. 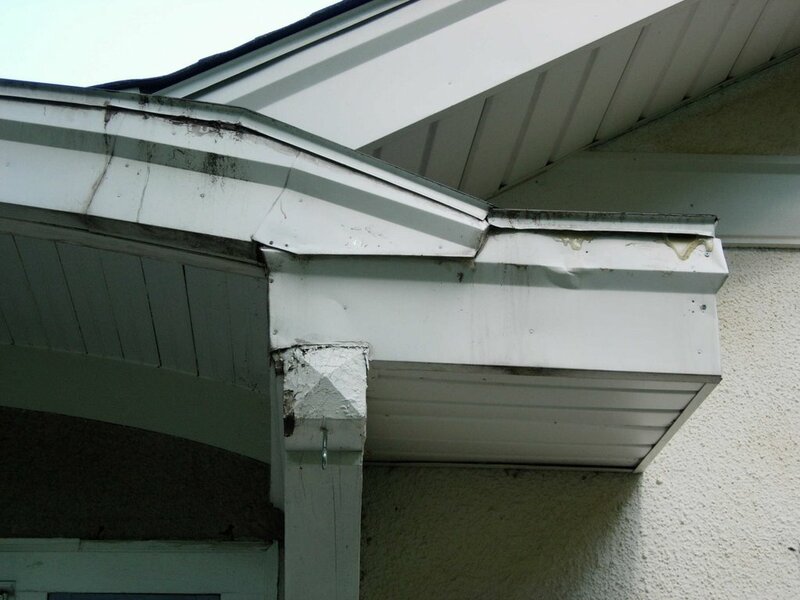 And isn't the drip edge suppose to extend out from the roof a bit? Tomorrow I will pull down the aluminum soffit on the right side of the overhang under the rotted board and look under there. I have a fear that there is a hole directly into my attic.....but I am hoping there is wood beadboard like under the eaves. I think I might be able to replace the 2x6 by myself....however this will take every iota of my skill. I'm not quite sure how I will get to the top side of the bracket, but I think this may be fixed by wood consolidator and two part epoxy. I have used this on my storm windows with good success. 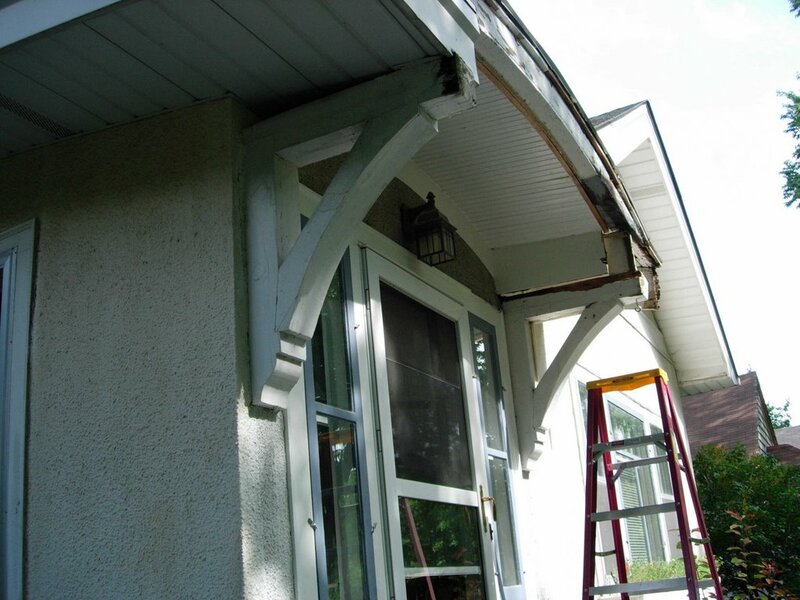 The plan is to then pull down all of the remaining aluminum on the overhang without disturbing the aluminum and soffits on the eaves on the rest of the house. 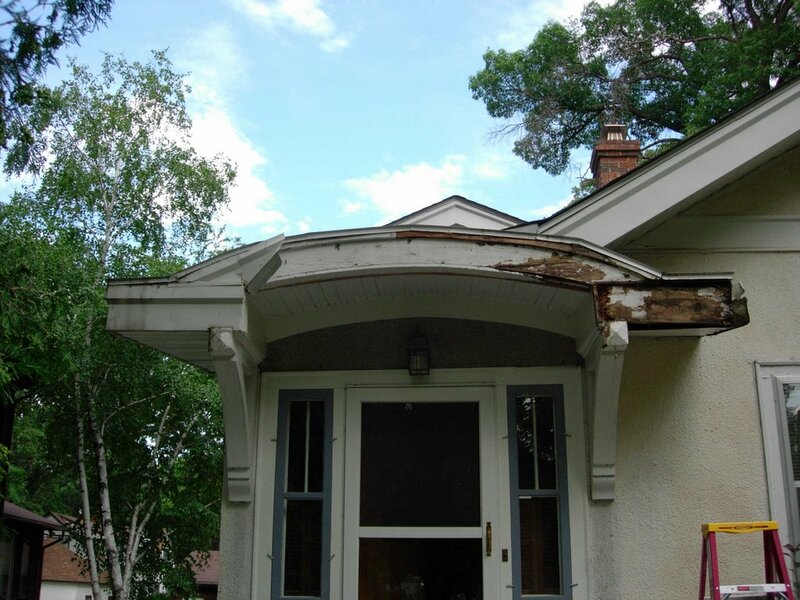 This is tricky because the left hand side of the overhang kind of runs into the eaves on the side of the house. I'm not sure how this will work on the 2x6 on the left side.....maybe pull it down in front and caulk/nail the aluminum down at the corner. Eventually, I would like to pull down all of the aluminum, but that is a can of worms I can't deal with right now.